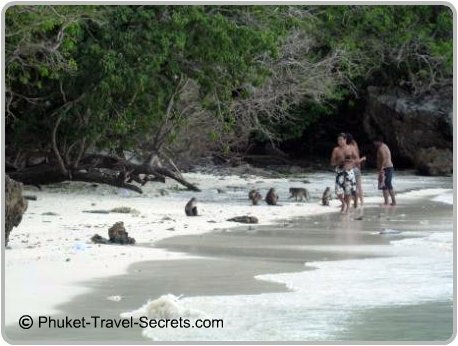 Monkey Beach is located in Yong Kasem Bay; on the west coast of the larger Island of Phi Phi Don. Yong Kasem Bay is a small jungle fringed bay, snorkeling here is excellent with clear water and good coral and a great variety of colourful fish. The beach is beautiful with soft white sand, one of the best ways to explore this hidden beach is by kayaking from Loh Dalum Bay. 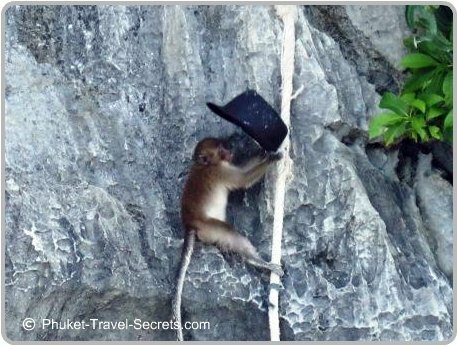 If you hire a kayak early in the morning or late in the afternoon, you might get to see wild macaque monkeys that come down to the beach from the cliffs to be fed. The monkeys live in the mountains and have figured out that where there is people there is likely to be food. 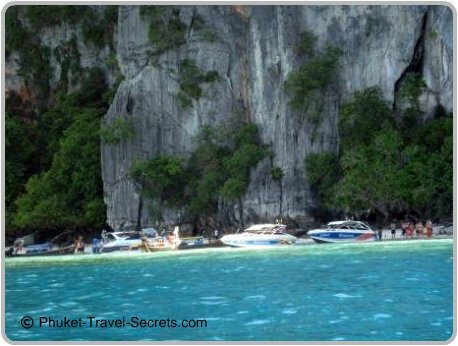 There are many day trips and speed boat tours from Phuket and Krabi which stop off at this beach as part of their tour. If you are staying overnight on Phi Phi Don it maybe wise to go to this beach either early in the morning before the crowds arrive. Or wait and go later in the afternoon, after the day trippers have left. You can hire a kayak which will take around 30 to 40 minutes each way or if you don’t want to kayak you can hire a longtail boat of the beach at Loh Dalum Bay . Monkey Beach near Loh Dalum Bay, shouldn’t be confused with Monkey Bay which is located on the left hand side of Tonsai Bay as you enter into the bay. 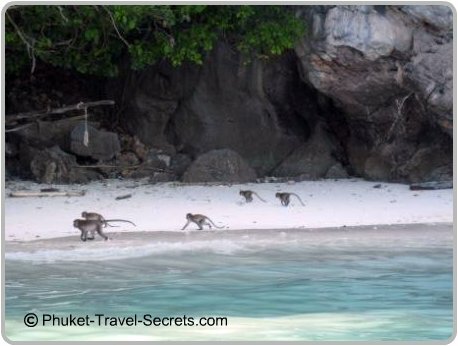 Monkey Bay is more commonly known, as it is highly visible from the boats when arriving into Tonsai Bay. Boat loads of day trippers and speed boat tours stop off here on their way to Phi Phi Ley. 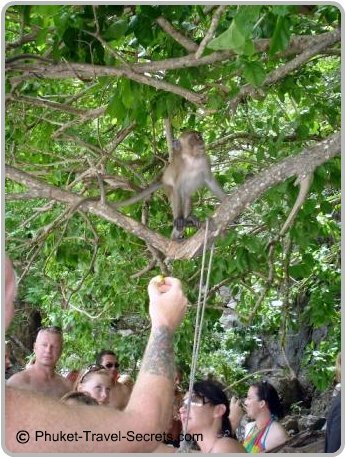 The best time to see the monkeys at Monkey Bay is probably in the afternoon when the beach is shaded from the hot sun by the limestone cliffs behind. 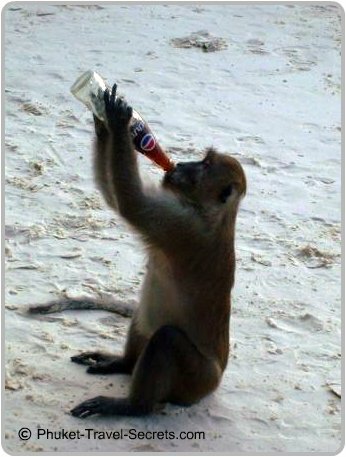 Take care of your valuables when you are around the monkeys as they are known to take off with sunglasses, hats, cameras or whatever they can get hold of. These are wild monkey’s, that clearly don’t have a fear of people. It is advisable to take photos from a distance and not to taunt the monkeys as they can become aggressive and may bite. 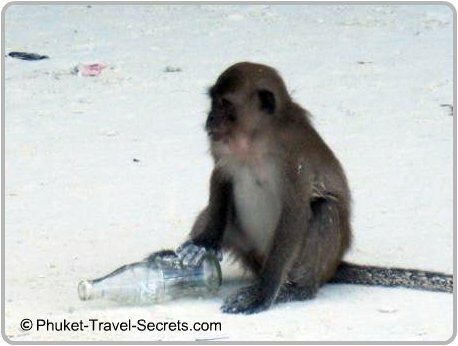 PLEASE NOTE: Many tour companies don't allow passengers to go ashore anymore due to the monkey's. They still stop close by so that you can take pictures.